If I'm not training for the Olympics, why would I need personal coaching? Whether you're 16 or 66, and at the front or the back of the race pack, you may want to train to the best of your ability. Personal coaching provides the daily and weekly adjustments and feedback from Coach Braz that give you the best chance to succeed. What if I sign up and need to take time off? When you are not able to train, we put your program on "hold" and any coaching months you paid for but have not used will be applied when you re-start your training. Are payments applied from the day I start training? We apply payments on a calendar month basis. If you begin training on May 10, your first month payment is for the month of May. However, if you begin training on May 25, your first month payment may be applied to June. How soon will my training begin after I sign up? There may be a week to 10 days before you and Coach Braz have exchanged enough information to allow him to create your initial coaching plan. If I'm a scholastic athlete, can I sign up for one-on-one coaching? Scholastic athletes may train with Coach Braz in the Cross-Country and Speed & Conditioning programs. In some cases, a scholastic athlete also may be eligible to train with Coach Braz in the One-on-One (Personal) Coaching model. How does the GTD program work with multi-sport events? 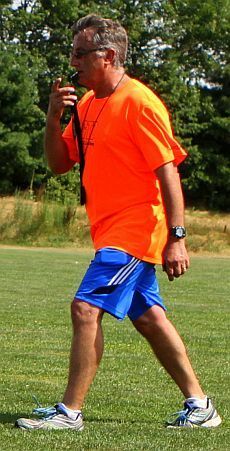 Coach Braz coaches athletes who focus on triathlons, duathlons, and running / field events. He works directly with the athlete on the running portion of these events.